This dish is similar to a one pot meal as you simply put the ingredients together in roasting pan and throw it in the oven to do the cooking. 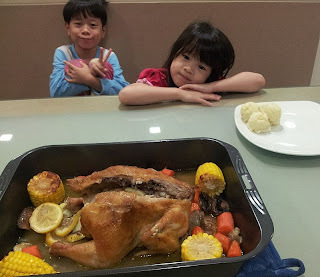 So its easy and enjoyable for the whole family to dig in. 3) Sprinkle salt and pepper generously on the chicken. Massage it. Add dried rosemary and thyme as well. 4) Rub one stick of butter all over the chicken, evenly coating it. 5) Cut up the vegetables. Roughly chopped. For the potatoes, you can also put in the oven together with the rest of the veggies. But I prefer my potatoes mashed. 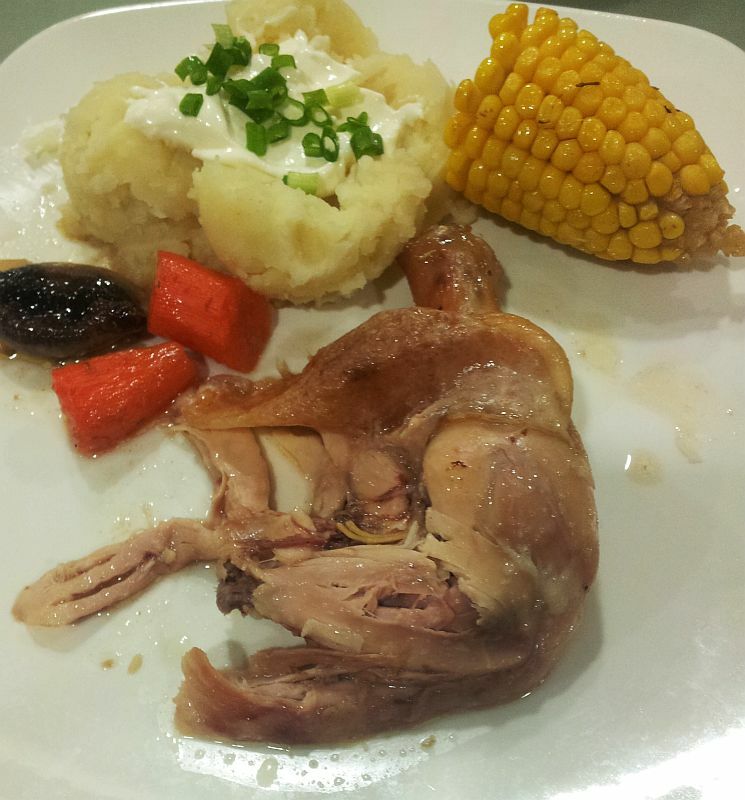 So I cooked them in boiling water and mash them with butter as a side. So, you see which you prefer. To oven cook it or mash it. 6) Put the chicken and cut up vegetables in the roasting pan. Distribute remaining butter evenly on top of the vegetables. 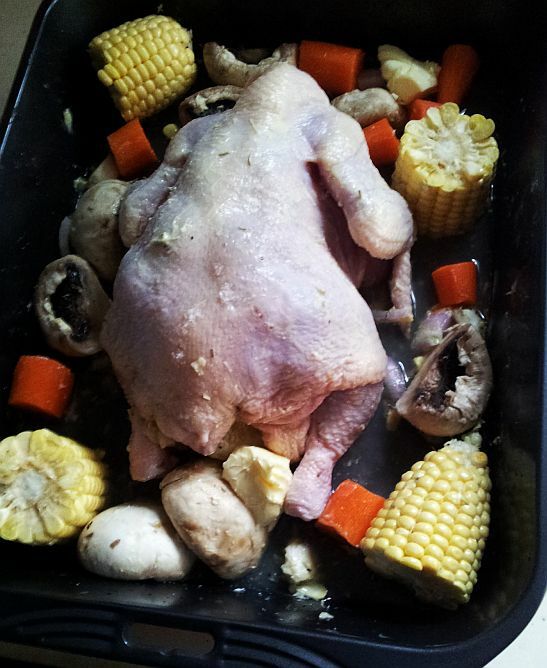 When placing the chicken, place it on top of the vegetables. 7) Finally, I use about 3 cups of chicken stock and pour it into my large roasting pan so that the moisture can help cook the vegetables and make my chicken meat moist. 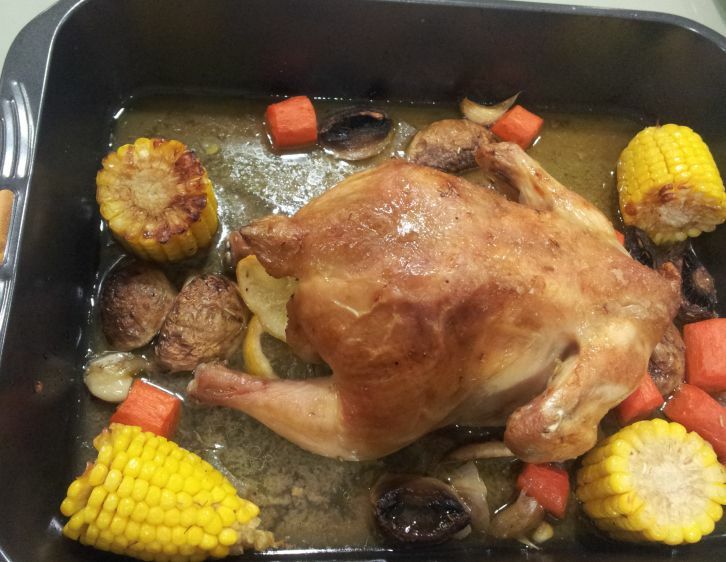 8) Then, put the roasting pan into the preheated oven. Once you put in. I turn it down to 200 degrees celcius. Put on the timer for about 30 mins for me to check on it. It should take about 30-45 mins depending on how big is your chicken and how crispy and dark colour you want your chicken to be. My children all helped in the cutting of vegetables and marinating of chicken. So it was a sense of accomplishment for them to see their effort on the table! Here's my dinner plate. Added mashed potatoes topped with sour cream and spring onions (chives). Everyone enjoyed it so much that there was no leftovers at all!